Mike and Murray Fenton welcome you to Alaska and thank for your interest in Fenton Bros. Guided Sportfishing of Alaska, LLC . 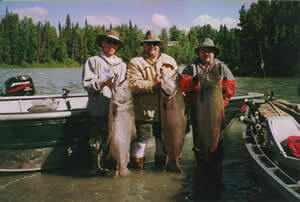 If you enjoy sportfishing, the Fentons are your guides and the Kenai Peninsula is the place. Fenton Bros. provide fully guided one-half-day, full-day and and package trips that are sure to meet your needs. The Fentons' boats are cutom-built, 20-foot, U.S. Coast Guard-approved powerboats and drift boats, and are designed for your safety and comfort. Each is designed to accommodate four fishers per trip though we can add more if you request. You will be provided with padded seats, bait and top quality rods, reels and terminal tackle. Fish cleaning is provided for all of our clients and smoking, canning, freezing and taxidermy work is avialable. Fenton Bros Guided Sportfishing of Alaska, LLC is located in Soldotna, Alaska, 150 miles south of Anchorge on the Kenai Peninsula. If you have time we recommend renting a car or R.V. and taking the scenic drive to our location. Driving time is a little over 2 hours on paved highway. There are also many connecting flights between Kenai and Anchorage, with rental cars available at the municipal airport in Kenai (10 miles west of Soldotna). Because the Kenai is such a popular destination, and the Fentons' popularity, we recommend that you book your trip early to assure you get the days that you prefer. The Fentons take pride in being a full-service operation and giving you, our guest, that personal attention you deserve. Mike and Murray Fenton of Fenton Bros Guided Sportfishing of Alaska, LLC invites you to Alaska for a memory-building trip of a lifetime.